A bitter, divisive race between Democrat Terry McAuliffe and Republican Attorney General Ken Cuccinelli is over and it turned out to be a nailbiter. McAuliffe defeated Cuccinelli in a surprisingly razor-thin 47- 46 percent victory to become Virginia's next governor, breaking a long Virginia tradition going back to 1977 of voting for a governor from the opposing party of the sitting president. According to exit polls, both McAuliffe and Cuccinelli did very well among their own partisans - each getting more than nine in 10 votes from members of their own parties. Cuccinelli had a nine-point edge among independents, who make up three in 10 voters in Virginia. 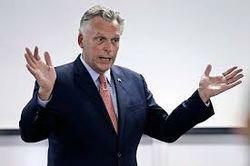 But McAuliffe did better than Cuccinelli in getting out his base: slightly more voters described themselves as Democrats (37 percent) than Republicans (32 percent). McAuliffe also won among voters under 45 and college graduates - both groups that McDonnell won four years ago - and he led among moderates (22 points) and women (9 points). Lies and smears in the end won out. Helped by a Republican Party refusing to support their candidate. "Snobbish, Intolerant, Stupid, and Unwarranted Intrusion"